Habit: Annual or perennial herb, generally tufted, occasionally from rhizomes or stolons. Stem: generally erect. Leaf: sheath generally smooth, glabrous; ligule membranous; blade flat to rolled. Inflorescence: panicle-like, densely cylindric to openly ovate. 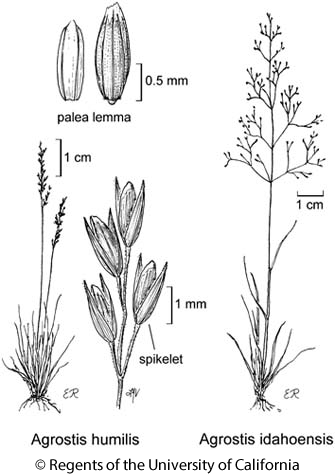 Spikelet: glumes generally subequal, back generally glabrous, vein generally finely scabrous, 1-veined, generally acute; floret 1, < glumes, generally breaking above glumes; callus glabrous to densely hairy; lemma generally 5-veined, veins not converging, occasionally extended as short teeth, awned from back or not; palea generally 0 or << lemma, translucent; anthers generally 3. Species In Genus: +- 220 species: especially temperate America, Eurasia. Etymology: (Greek: pasture) Note: Some cultivated in pastures, lawns. Agropogon lutosus (Poir.) P. Fourn. is a sterile hybrid between Agrostis stolonifera and Polypogon monspeliensis. Agrostis viridis is treated as Polypogon viridis. Agrostis nebulosa Boiss. & Reut. is reported for California (FNANM 24: 661), but no specimens have been located. Generic delimitation adopted here reflects editorial preference. Agrostis lacuna-vernalis newly described, added as native. Habit: Perennial herb 8--30 cm. Leaf: basal and cauline; ligule 1--3 mm; proximal blades 1--5 cm, 0.5--2 mm wide, flat, often inrolled with age. Inflorescence: 3--13 cm, lanceolate to ovate in outline, +- open; 1° branches generally ascending, axes +- stiff, proximal 1--4 cm, axes thread-like. Spikelet: glumes 1.5--2.5 mm; callus glabrous or hairs < 0.3 mm; lemma 1--2 mm, awn 0; palea minute, << lemma; anthers 0.3--0.5 mm. Synonyms: Agrostis tenuis Vasey, illeg. Citation for this treatment: Paul M. Peterson & Michael J. Harvey 2014, Agrostis idahoensis, in Jepson Flora Project (eds.) Jepson eFlora, Revision 2, http://ucjeps.berkeley.edu/eflora/eflora_display.php?tid=12297, accessed on April 21, 2019. NW, CaR, SN, n SnFrB, SnBr, SnJt, W&I; Markers link to CCH specimen records. Yellow markers indicate records that may provide evidence for eFlora range revision or may have georeferencing or identification issues. Purple markers indicate specimens collected from a garden, greenhouse, or other non-wild location.